At the start of September 2016 I spent three days onboard MSC Splendida to review her as she sailed from Hamburg, Germany to Southampton via Le Havre in France. This was my first time onboard one of these Italian ships and I have returned home with a changed view. 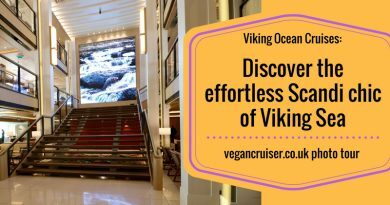 Any hesitancy regarding booking a cruise holiday with them is now gone and I can say I am now a fan – which you can tell from my blog post from last week. 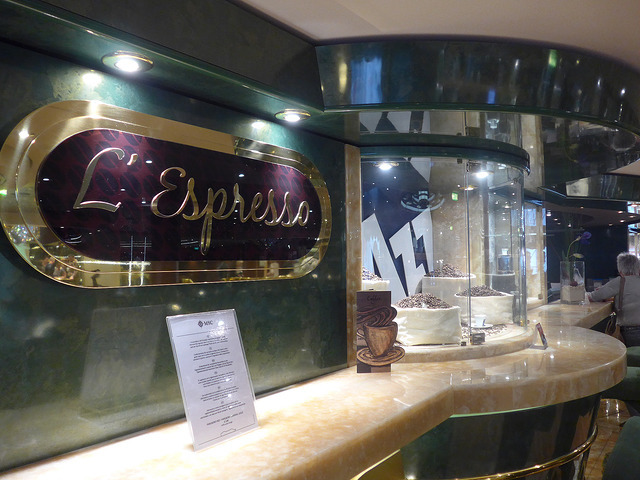 Here’s the proper start to my MSC Splendida cruise ship review series – starting with the decor and the Italian extravagance (which I loved). I really enjoyed Splendida; she is a vibrant and stylish young vessel attracting a younger crowd (at least on our sailing – very few families as it was during school term). And I don’t think she looks 7 years old at all – she is still very modern. Splendida oozes character and is laden with stunning decor such as Swarovski staircases in the atrium combined with a bold use of colour throughout venues that I loved. You’ll see what I mean as you get to the photos later in this post and especially the video at the end. The check-in experience in Hamburg was the most streamlined & efficient I have ever experienced in a cruise port. We had access to the VIP/suite customers’ check-in queue which normally would explain speedier embarkation but the general passenger queue only had a handful of people waiting in it too. Perhaps it was a combination of German efficiency and our early check-in at the port (late morning) but we had our cruise cards in hand in no time. After our speedy check-in, it was just the matter of clearing the airport style security: x-ray for carry-on bags and metal detector for us. This was followed by the cruise photo-op station. On this occasion I chose not to hurry past the photographers and instead convinced my friend, just about, to get a memento for us. We didn’t have an embarkation photo taken in May when boarding in Venice so I wanted one from this second girlie cruise of ours. After our speedy check-in, it was just the matter of clearing the airport style security: x-ray for carry-on bags and metal detector for us. This was followed by the cruise photo-op station. On this occasion, I chose not to hurry past the photographers and instead convinced my friend to get a memento for us. We didn’t have an embarkation photo taken in May when boarding in Venice so I wanted one from this second girlie cruise of ours. After our cruise photo (which I later purchased onboard) we made our way to the upper floor of the terminal and onto the ship. As we entered we got our fresh cruise cards scanned for ID check and found ourselves in the gorgeously decadent central lobby. Feast your eyes on this bling! Apparently, the cost of the Swarovski stones in the atrium stairways was nearly 3million USD! 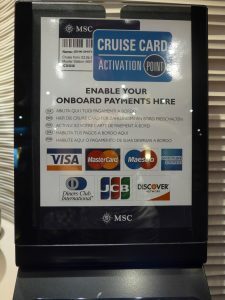 On all of my other cruises, I’ve always had to register a credit or debit card as security towards onboard purchases at check-in. On this occasion, the friendly MSC check-in staff advised us to do that ourselves once onboard the ship – perhaps one reason why the process in the terminal is as speedy as it is. As we entered the opulent central lobby I found a few terminals located on two levels to do just that. 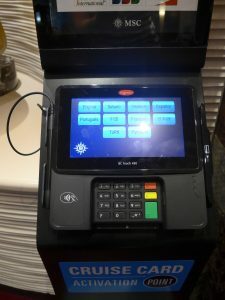 The process of swiping my key card and registering a payment card for security was very simple and directed by the terminal – you could have a security hold placed on your credit card as usual (charged to your account at disembarkation) or have a refundable deposit taken off your debit card. In addition to her youthfulness (and the bling), I enjoyed Splendida because of her size. Splendida is the 2nd largest of ships I have been on so it has lots of venues and general space so she never felt cramped. She is 330m long – that’s over three football/soccer fields – has 18 decks and carries 3,900 passengers at full capacity. During our short taster sailing, she never felt crowded as there were so many venues onboard for drinks, entertainment and dining. A range of venues also meant a wide range of music onboard during the day which I loved. 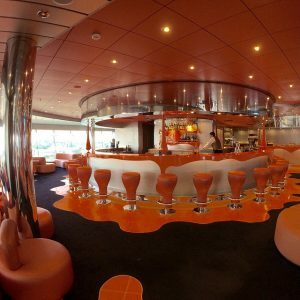 Never have I been able to sit in cruise ship bar and listen to 90s to present day indie/alt rock. Each of the venues has a wonderfully different character – it is like stepping from one world to another rather than sailing on one of those uniform Hilton-on-the-seas style of ships. Thankfully this cornucopia of design styles (colours, music) is knitted together with minimalist black, grey & chrome used in signs, staircases and on the landings for lift access. Another difference upon arrival, and a much-welcomed one, was a left-luggage service for hand baggage (larger luggage was left with staff at the terminal to be delivered to the cabin). Normally if you check in early and your cabin isn’t ready, you need to haul your belongings with you to the buffet and around the ship. Instead, it was nice to just leave my trolley case for storage. So off we went to the Bora Bora buffet to explore and to start our cruise adventure with a cocktail. By the time we finished lunch our cabin wasn’t ready so we explored the ship until the time came to see our cabin. Here’s a selection of photos from our walk. 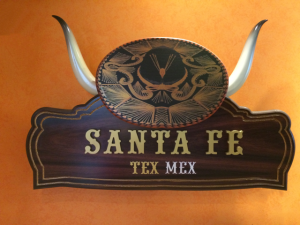 The specialty restaurant (extra charge) onboard MSC Splendida is a Tex Mex themed Santa Fe. Annoyingly even though the menu had various different meaty & seafood fajitas, they had chosen to serve me a veggie burger and not vegetable fajita. 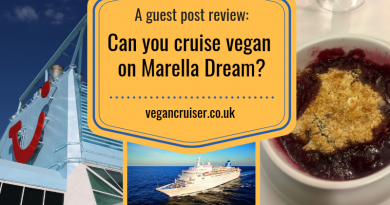 See my post on vegan dining onboard here. You could enjoy views of the Swarovski-laden atrium and stairs from the adjoining l’Espresso cafe… if you enjoy people-watching. 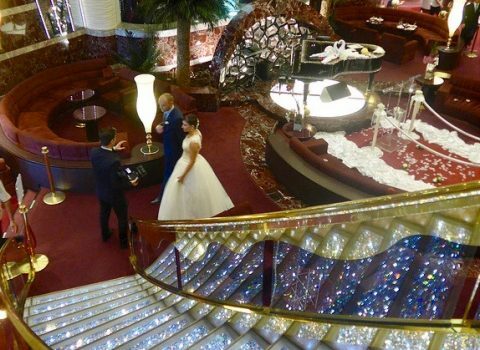 We even had a Russian wedding onboard and could observe it from the cafe area! 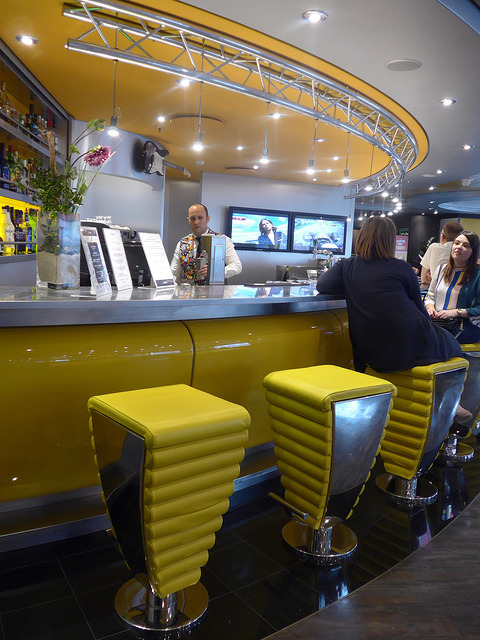 There were many beautiful bars, including a separate wine bar onboard. One I preferred the most for its appearance is featured below. Sadly it always seemed very quiet – apart from the muster drill. 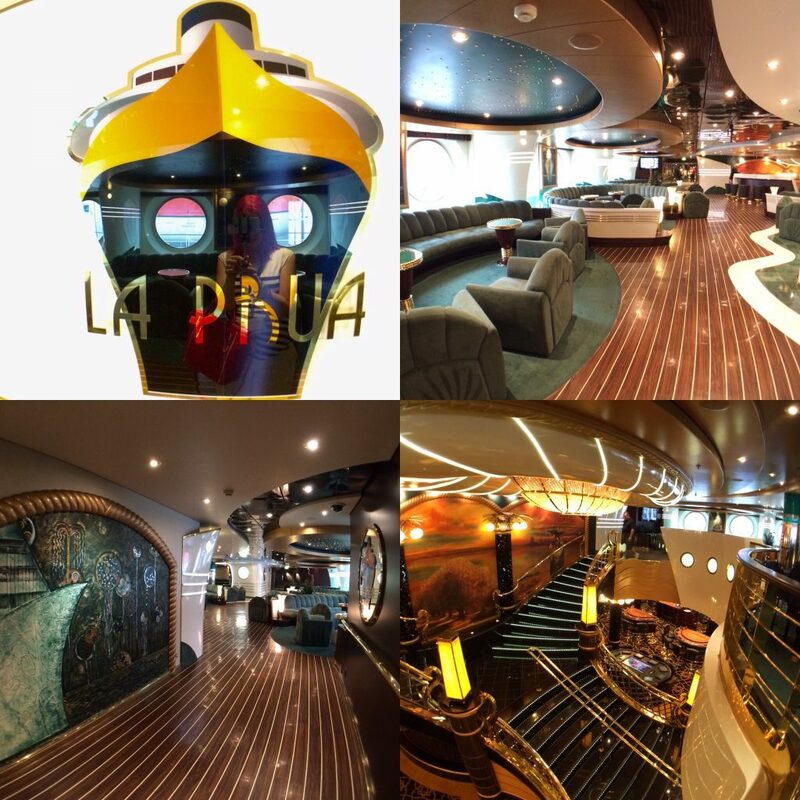 The La Prua piano bar has an art deco ship feel to it.. it’s a ship on a ship! See the portholes on the lower right photo, in the staircase leading down to the casino. And of course the actual windows were styled round as well, as seen on my reflection and along the sofas. Splendida has a fabulous sports bar with wide range of drinks, snacks, booths with TVs for watch games, Formula One etc and twin-lane bowling alley! 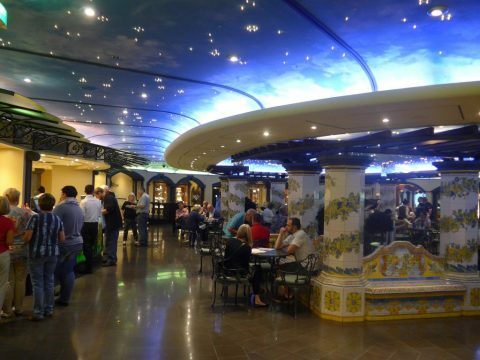 There is an Italian La Piazzetta courtyard cafe.. pastries, gelato and drinks with an articial starry sky above you..
As the time neared 2 pm we headed to our cabin to see if it was ready and whether our checked-in suitcase had been delivered. We had been allocated to a balcony on deck 13 and yes, our cabin was ready as was our case. An interesting fact: American ships tend to skip deck 13 altogether..but the Italians clearly had no issue with it. 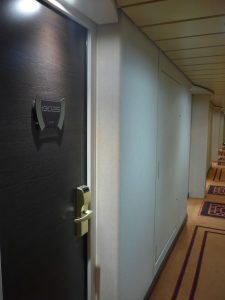 Ours was an Aurea Spa balcony cabin far forward (front of the ship) and it was another pleasant surprise! These Aurea cabins sit directly underneath the beautiful onboard Balinese Spa (I’ll post a separate entry about it too as it was gorgeous). 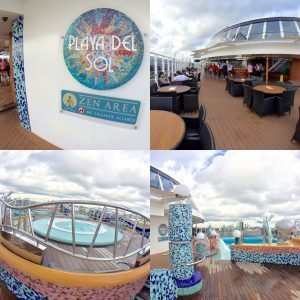 Booking this class of balcony or suite you normally get spa robes, slippers, a massage treatment of your choice included with access to the Thermal Suite for the duration of your cruise. But as we were competition winners, no spa extras were included. Our delightful balcony cabin was not that different from the balcony cabin I had on Celebrity Silhouette in 2014 – which still is my overall top favourite cabin and the yardstick by which I measure every other. I was impressed with MSC too! Upon entering we found adequate wardrobe storage for two ladies (with a digital safe). A good-sized white bathroom with beautiful fittings was located across from the wardrobe area. Unlike some cruise cabin bathrooms, this had enough storage shelving for all our toiletries. In the shower, there was a shower gel & shampoo dispenser on the wall – not every cruise line provides these. The cabin itself had twin beds high enough to store suitcases underneath – and could be converted to a double, naturally. The fridge housed in the vanity/desk opposite our sofa bed wasn’t really necessary on this short trip but on a week-long cruise one does come in handy for storing cakes and goods bought while off-ship. The balcony we had was of a good size though not as large as the 2014 Silhouette one. The bathroom was not far off in quality of the Celebrity: though the shower had a curtain (cubicle being my preferred choice). 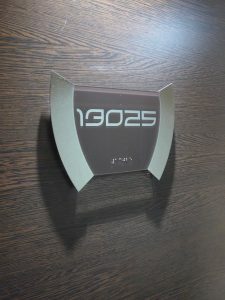 The Italian designers had demoted the TV above the vanity/fridge in the lounge area – freeing the space opposite the beds for a large wall-hung mirror instead. If nothing else, it makes getting ready & dressed for dinner much easier when two ladies share a cabin. As our balcony was part of the Aurea Spa cabins the colours used in decor were the same as in the spa (earthy warm browns and yellows) and the cabin corridor had gentle spa-type music piped into it during the daytime hours. Rather delightful, I may say. Before we could sail from Hamburg the traditional muster drill had to take place. These vary depending on ship/company. I have been on cruises where you don’t take your life jacket and stand outside by your designated life boat. On an MSC muster drill, you take your life jackets to the muster point – ours was in the Prua piano bar. As usual, we had our cruise cards scanned to confirm attendance and then we waited. And waited some more while latecomers made their way in. Eventually, an announcement was made, explaining the emergency signal and how to secure your life jackets correctly – in various languages. Think I may have counted 6 on our sailing: English, German, Italian, Spanish, French and Russian. This had been one of the common complaints online that had put me off from travelling with MSC – so many UK travellers had made negative comments about the multiple languages used onboard, continental service & food and the range of nationalities on the ship compared to US based companies. And yes, I did not hear a single American voice on our trip and us Brits were in the minority but that did not make it a bad experience. Perhaps extended the muster drill slightly but nothing that I could complain about. After the muster, we were free to go and continue to enjoy our stay and the cocktails included in our drinks package. The weather wasn’t the greatest – Hamburg was quite grey and the rain was on & off so I don’t have photos or video of the sail away to share. We continued to explore this beautiful ship and later met other competition winners for cocktails in the fabulous Purple Jazz Bar (which played no jazz, just lounge music live or recorded). Some of our group went to see a theatre show pre-dinner while others, like us, stayed to mingle until dinner. Our first night’s dinner was served to us at the exclusive Yacht Club restaurant courtesy of MSC UK – normally only available for the premium Yacht Club passengers. After dinner, it was time for us to retire to our comfortable cabins as we’d had an early rise to fly out of Heathrow that morning. Plus we had another early morning rise ahead for a ‘behind the scenes’ excursion onboard we’d kindly been gifted for the next day. It was a great first day. As for vegan food..well, that will be another separate blog entry covering the length of our three days onboard. Stay tuned – for day two! Any questions or comments, don’t hesitate to use the comment facility below! PS. This promotional video may explain why I now am a big fan of Splendida if my photos didn’t quite convince you. Looks amazing! 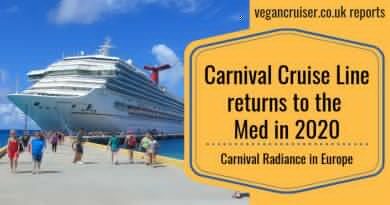 I’ve only been on Carnival cruises. 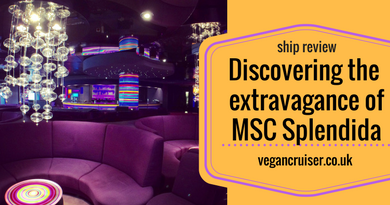 I see deals for MSC all the time, but since I knew nothing about them and the deals sounded almost too good to be true, I was a bit skeptical. I’ll be sure to jump on it next time! We certainly had a good experience on this ship – service and venues were fabulous and the all incl. drinks package is great value (both levels). Buffet food was fabulous, evening dining room vegan options not that successful I felt – but that will be another blog post altogether. Apparently the US based MSC ships have got menus geared more towards the US market whereas in Europe they’re clearly Italian. If you normally travel with Royal Caribbean, NCL or Carnival, I would definitely recommend MSC. Wow, that ship looks incredible!! Sign me up!